Penélope Cruz has broken through barriers of ethnicity, gender, and stereotyping like nobody else, and the pictures by Mario Testino were wonderful. The only element I’m disappointed with is the retoucher’s heavy hand. By taking out the smile lines on either side of Cruz’s mouth on the cover photo, you robbed her of the very character, wit, and genuineness that make her my most beloved actress of all time. 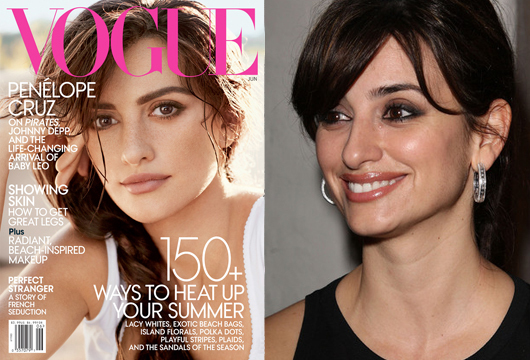 The Vogue cover, May 2011 and a candid, unretouched photo of Penélope Cruz. The actress has a radiant beauty that is more about larger-than-life vivacity than digitally ironed skin. Thanks for your support, Kimberly! Much appreciated. I agree completely. And I am glad that they printed it.